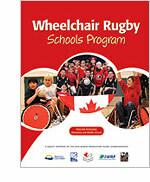 The wheelchair rugby schools program was designed by teachers for teachers and is intended to be flexible enough to meet a wide range of educational needs. While the thirteen lessons were originally designed to be taught in sequence, they stand alone and can be taught individually or combined with any other lessons to make up a unit of your choosing. To your right, you will find downloadable PDFs of all the lesson plans. These contain teaching plans, PLOs, handouts, glossaries and all other supporting materials. To your left, you will find an electronic version of these documents, which contains links to all online supporting materials. This section will be updated to ensure that all online resources are current. Lesson 2 - What is a Disability?